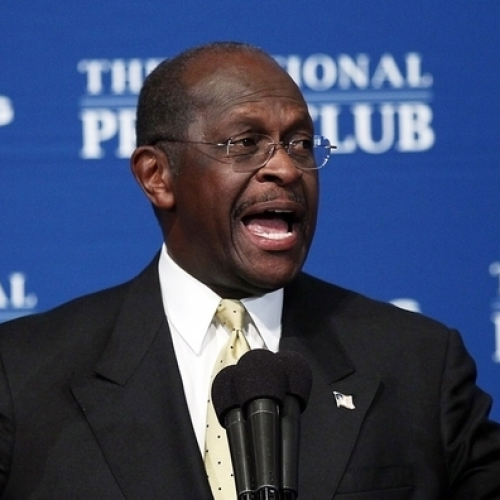 Herman Cain’s appearance on Monday at the National Press Club had all the makings of a classic feeding frenzy: The frontrunner for the Republican presidential nomination, wounded by new allegations of having committed sexual harassment against former employees, was to face a room full of hungry Washington, D.C. reporters eager to draw fresh blood. What took place wasn’t a harsh interrogation, but in its own way, it was equally revelatory. Whether Herman Cain has the makings of a policy maker is yet to be determined, but Monday’s event served as a reminder that his talent as a showman has few parallels in either party. Indeed, Cain’s appearance showed just how firm a grasp he has of the first dictum of all entertainment—namely, that no matter what happens, the show must go on. The Cain campaign has long put an emphasis on spectacle, with its bizarre viral video ads (see “He Carried Yellow Flowers,” a Western spoof), and its embrace of a YouTube video that shows Cain singing his own rendition of a John Lennon song, “Imagine There’s No Pizza.” At Monday’s event, Cain decided to confront the most serious challenge to his campaign in the same spirit—though in this case, Cain decided things were serious enough to merit both singing and baked goods. Far from there being an atmosphere of intimidation before the gathered press corps, there were whimsical gestures toward them, with each table at the event offering cupcakes decorated like pizzas, or stamped “9-9-9” and embellished with red, white, and blue sprinkles. Four minutes after he started talking, Cain dismissed the harassment allegations against him with an all-out denial, calling the whole issue a “witch hunt.” Far from showing any actual discomfort at the revelations, or offering a legalistic denial, as one could easily imagine most of his Republican competitors would have done, Cain denied the allegations against him with true enthusiasm. “I am unaware of any settlement. I hope it wasn’t for much, because I didn’t do anything,” he added. And that was that. On to more pressing matters. After all, there were sound bytes to be generated about race relations (“This many white people can’t pretend that they like me,” Cain told the audience), and tax plans. (“How sweet it is!” he said, holding up one of the event’s 9-9-9 cupcakes and freezing so photographers could take his picture.) He also readily took Hamrick up on his invitation to grace the audience with a song—a verse of the gospel song “He Looked Beyond My Faults.” If Cain was anticipating that his serenade would distract from the substantive charges against him, he was both cynical about the Washington media and entirely correct about it. Immediately after the event, his singing attracted much more scrutiny on the Internet than his vehement denial of the sexual harassment allegations. Of course, it wasn’t for lack of media presence at the event. But most journalists seemed to be more interested in acquiring images of Cain after the event than in confronting him during it. Dozens of reporters and their camera crews clogged the foyer after the event, waiting for Cain to emerge from the ballroom. When it was clear that Cain had avoided the horde on his way out of the building, camera crews and reporters swarmed the elevators. One of them, apparently eager to find a faster way to the ground floor, opened a stairwell door and briefly set off a fire alarm. For all the trouble Monday’s appearance could have caused the candidate, Cain acquitted himself before the media by virtue of his effervescence. And it will all be remembered as having gone off without a hitch—as long as he was telling the truth. It jibes perfectly with the winning, personable candidate that has become so popular with Republican voters. But unlike the meticulously-scripted denial, if in the next few months a settlement agreement surfaces with Cain’s signature on it, easily debunk-able phrases like, “I am unaware of any settlement. I hope it wasn’t for much because I didn’t do anything,” could easily be exploited by his competitors. The trustworthiness on which Cain’s sunny confidence depends for its appeal is much more fragile than one would think based on Monday’s event. In that way, things don’t look promising for him. His denials are already unraveling, with practiced sexual assault attorneys saying that there’s no way Cain would be unaware of whether he’d settled sexual assault allegations with payments.